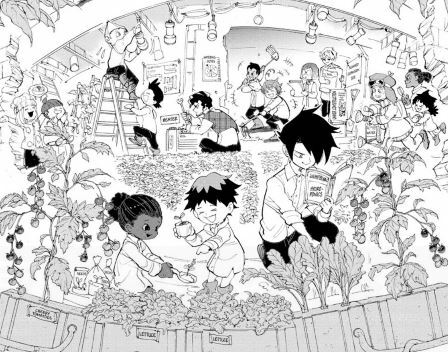 The Promised Neverland Recap – Chapter 99 – AiPT! The children find new clues about the location of the Seven Walls. This week’s chapter depicts the fallout of Emma and co.’s first contact with supposed allies via Minerva’s secret telephone. Emma, Ray, and Lucas decide to teach the entire group Morse code so that they can all take turns waiting by the phone for when their ally calls back. They also uncover a new message from Minerva with cryptic instructions about how to reach the Seven Walls. Emma and Ray decide that the best course of action is to send a small group to Cuvitidala (where hints about the Seven Walls might be found) while the rest of the party remains at their base awaiting allies. Emma and Ray are going to Cuvitidala along with Don, Gilda, Zach, and Violet. Yugo, meanwhile, is going to watch over everyone else at the shelter. The way the groups are divided up here is promising. Don and Gilda have been two of the most pivotal characters in terms of helping the Grace Field House children survive, but they haven’t actually received much time in the spotlight. Rather, they’ve usually been the characters who Emma and Ray assign background tasks to. That’s even the case in this chapter, as it’s revealed that they did translation work for Ray while he was at Goldy Pond. Hopefully the coming chapters will be better about developing these characters as they finally get to see some action themselves. The decision to have Yugo preside over the shelter is also a good one, as it shows just how far the group has come in terms of trusting him. Lucas will also be there, so I hope to see these long-lost friends catch up in depth soon. There are a number of exciting plot revelations and mysterious hints in this chapter. The source of most of these is Minerva’s cryptic message about how to get to Cuvitidala and then the Seven Walls. The directions don’t seem to make any sense geographically speaking, so it’s likely that Emma and co. are going to have to solve some riddles along their journey. The directions also reference a dragon’s eyes, which begs the question: are there actual dragons in The Promised Neverland’s world? Thus far we’ve seen demons and a variety of strange plant species, but none of the standard mythological creatures. Having dragons show up would be a cool way to expand on the series’s lore, especially since Demizu would surely do a fantastic job drawing them. Speaking of Demizu, her work is solid as always this week. One of my favorite parts of her skill set is how she effectively conveys the relationships between objects in physical space. It’s always very clear what objects are above or below each other, as well as which are closer to or farther from the reader. The perspective throughout is just great. My only complaint with the art in this chapter is that some of the minor characters’ faces look wonky fairly consistently. With that said, Demizu’s shading, perspective, and flow of movement are still as on-point as usual. My last note about this chapter is one that applies not just to it, but that has come up repeatedly over the series’s run. Shirai and Demizu have a tendency to let some fairly intriguing events happen off-panel, and this doesn’t always seem like the best decision. Take, for example, the translation work that Don and Gilda are revealed to have done while Ray and Emma were at Goldy Pond. We get to see the fruits of their labor in this chapter, but it would have been neat to see some of the actual work as it happened. So much of this series revolves around the protagonists untangling webs of intrigue and searching for meaning in a world they don’t fully understand. Why not, then, dive more deeply into the search? One could argue that skipping to the end results of Don and Gilda’s efforts saves time and helps move the plot forward. This is especially beneficial given how long the Goldy Pond arc dragged on for. With that said, I still wish that we had gotten at least some hint about what Don and Gilda were up to prior to their being finished. That’s all for this chapter! Stay tuned for more recaps as The Promised Neverland updates every week. If you’re interested in reading more of our thoughts about the series, check out our column on the previous chapter, as well as our review of the latest collected volume.